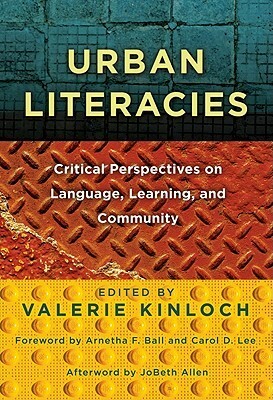 Urban Literacies: Critical Perspectives on Language, Learning, and Community is an invaluable resource for teachers who plan to enter urban spaces or teach students of color. Valerie Kinloch curates a brilliant selection of essays from some really important voices in the world of literacy and education. David Kirkland, Marc Lamont Hill, Susan Power-Carter and Dr. Kafi Kumasi are some of the contributors--huge names in the field of social justice education. This book helped me answer my own questions pertaining to what business I have teaching students of color in their own environments. As I read this book, I could not help but think about the necessity of more teachers of color in schools and in neighborhoods where the student populations are black and brown. I thought about Hill’s stepping into black revolutionary “counterpublic spaces”--spaces that provide knowledge that is outside the normative, “book store”, white conformist (mainstream) information wealth and how necessary it is for black youth to reclaim the one-dimensional knowledge that they have garnered in the American schooling system. It has been interesting reading this book and seeing the school I work in through a new lens: I am definitely more susceptible to perceiving the white-normative attitudes, behaviors and pedagogies that occur in classrooms now that I have this knowledge. Though I work in a school that is “diverse,” (and by "diverse" I mean still 69% white); there is a single narrative going on: one of whiteness. It never occurred to me before having this knowledge that this is probably the case because of the nature of our school systems and how they were set up historically. Brown vs. Board of Ed (1954) did not integrate schools as much as it simply “allowed” black students into already well-established “white spaces.” That is, the knowledge that was disseminated to students, the attitudes, behaviors and norms, were already set in the context of whiteness--long before students of color were legally permitted to have a say in their construction, much less attend and participate in the American educational structure (and from my regional experience, there is little representation by people of color on school boards, in meetings, and curriculum in predominantly white settings). The knowledge that students attain in classrooms exists on top of a “white undercurrent” that can and certainly does observably interfere with the identity development of students of color.Urban Literacies has a common theme among the essays it contains: to examine the ways in which urban education and the existence of black and brown students in schools has historically been a response to whiteness, and in making readers aware of this myopic phenomenon, seeks to change it through disruption of normative teaching and learning paradigms. As an in-service teacher with the potential for her own classroom, this book has made me realize that doing all the reading in the world could not ever prepare me to teach urban youth or youth of color (because those aren’t always necessarily mutually exclusive)--and that as a white person, I have a responsibility to deconstruct the privilege that I share with white students in largely white neighborhoods so that we can understand and create counter-public spaces that recognize privilege, inequality, oppression and democracy for what it is rather than letting these things exist as an ideal. The classroom I hope to someday create confronts these ideas directly and questions why anti-oppressive pedagogy is not often combined with anti-oppressive action, especially with respect to "color-blindness" and other forms of micro-aggression that seeks to claim that as a society we have "gotten there" in terms of racial equality and equity. My intention in teaching radically this way will be to make students think--live in their own sort of “double consciousness” without white guilt (which centers the narrative, yet again, in an undercurrent of whiteness). It also shifts students who already have power into positions of equity and understanding of the cultural differences and the differences in responses needed for students of identities differing from theirs that are necessary. This interesting collection of research shines a light on a number of poorly understood—hence woefully underutilized—resources for literacy and language instruction in urban environments. As the book’s three main divisions indicate, these resources (family, community, and popular culture) can expand our understanding of what it means to be literate. The scholars who share their work in this volume advocate a more inclusive conception of literacy and present their work, both empirical and theoretical, in support of innovative pedagogy that will help broaden the academic value of urban literacies. I read this when I was trying to figure out a theoretical lens to use for a project. I thought this provided a good context for critical thinking in an urban environment.